The Java hashCode method is one of the Java String Method which is used to find and return the hashCode of the User specified string. In this article we will show you, How to find String hashCode in Java Programming language with example. The formula behind the hashcode is: s*31(n-1) + s*31(n-2) + .. s(n-2). Here, s[i] is the ith character of the user specified string and n is the string length. NOTE: The hashCode value of an empty string is Zero. 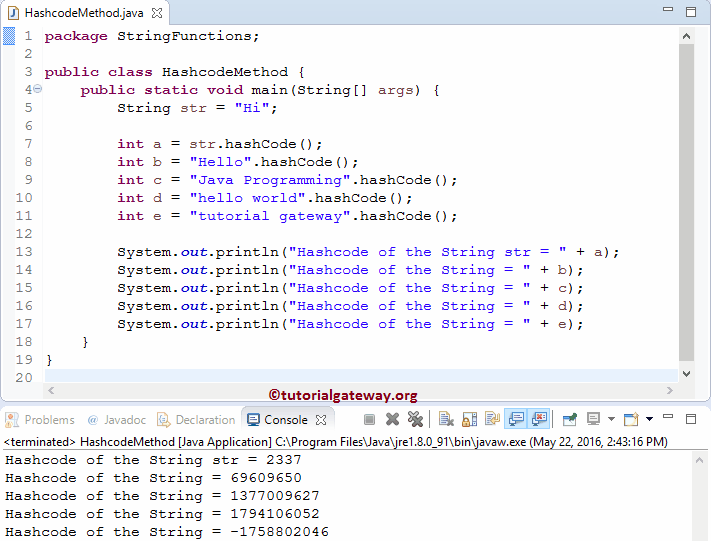 The basic syntax of the string hashCode in Java Programming language is as shown below. The Java string hashCode method is used to return the hashCode value of the user specified string. In this Java program, We are going to find the same. The following statements will find the Java string hashCode method of the above specified string. Following statements will find the Java string hashCode of the strings and then assign the hascode values of those strings to the integer variables b, c, d and e.